"Get a total body workout with 32 electrifying new routines and music tracks, including hits from today's hottest artists including Pitbull, Nicole Scherzinger and Yolanda Be Cool & DCup. Get your party on in 5 stunning, dynamic environments, from a Miami Yacht to a LA nightclub. Watch the party grow as you match moves throughout each area!" What we thought: WOW! What a workout!! This game matches if not exceeds the workout I've gotten from actual Zumba classes! We played the original Zumba Wii game and this was equally fun:) We really enjoyed the addition of the Bellydance, Latin Pop and Pasodoble routines. This is a fast-paced game that will definitely help you get your burn on while enjoying every minute. The belt is great for a hands-free workout. The variety of songs and routines makes for a unique workout each time that never gets boring! This would be a great gift for those looking for a fun workout! 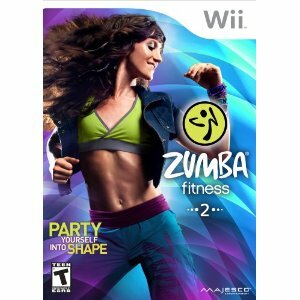 ABCD Diaries gives Zumba 2 for Wii an A+! Buy It: Get Zumba 2 wherever you buy video games!